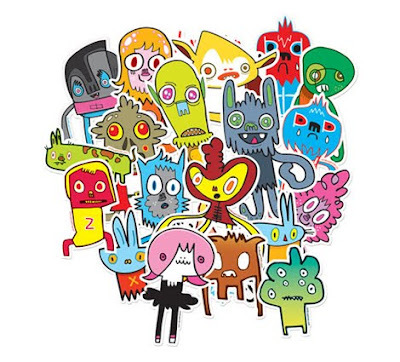 We are very happy to confirm that Mr. Jon Burgerman will be contributing to the Christmas cards project. We have personally been big fans of his work for many years and it is a real honour to have him on board for this project. Watch this space for more details. We are currently organising an exciting new project based in Bristol in support of the local Charity ‘YoungBristol’, a volunteer based charity that works with young persons aged between 16-25. They offer opportunities for young people to develop their skills, achieve goals and build confidence. The project is entitled “All I Want for Christmas” and is to involve 25 illustrators and artists local to Bristol, with the principal idea being for each artist to donate a single design based around the theme ‘All I want for Christmas, which will then be printed on to cards and placed in packs to be sold for Christmas through local shops, galleries and online. The packs will be limited to a run of a thousand. There will be a launch night at the Arnolfini Bristol, where all the designs included within the packs will be scaled up, exhibited and sold in a charity auction. The mission statement for this project is for us to help raise awareness and money for a very worthwhile local charity by bringing artists and people of Bristol together to get involved in something really positive this Christmas time.